Senior forward on the women’s soccer team, Katie Aubuchon was one of the first Webster athletes to share the story through Twitter on Oct. 31. Freshman forward on the men’s soccer team, BJ Dryer said the billboard was “off-putting” as an athlete. Two of the University of Missouri-Columbia billboards on Interstate 70. They sit less than 10 miles before Webster University’s billboard eastbound on I-70. Costello said the billboard is not about the chess team. Webster Director of Public Relations Patrick Giblin said the words on the billboard are not meant to be taken seriously. Mizzou’s billboards promote its nationally ranked Division I athletics like football and volleyball. Maggie Zehner, member of the Webster women’s basketball team from 2009-13, texted all 70 of the Webster student contacts she had in her phone, and urged them to tweet at Webster (@websteru) about the billboard posted on Interstate 70. Zehner’s text was sent at 9:28 a.m., Nov. 3. 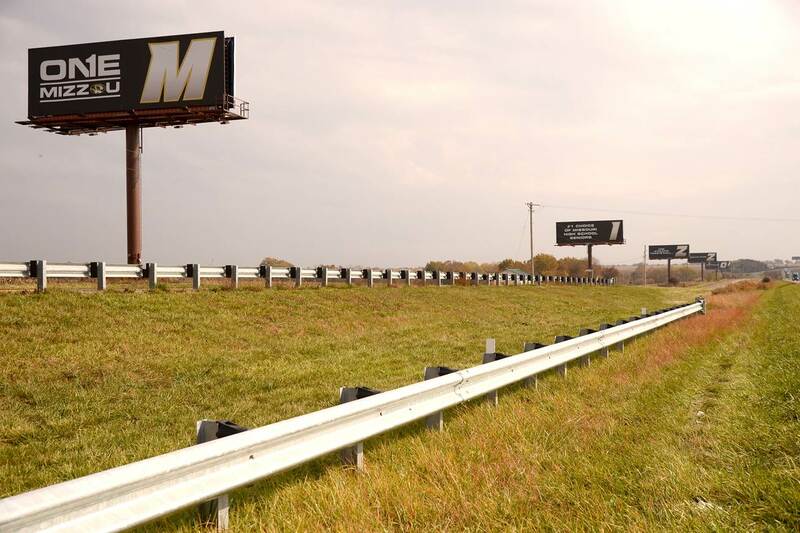 Two University of Missouri-Columbia billboards on I-70 sit less than 10 miles before Webster’s billboard eastbound on I-70. Zehner said her goal is for Webster to take the billboard down. 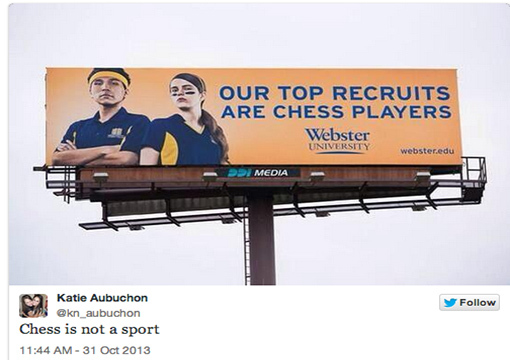 Susan Polgar, Webster chess head coach and director of Susan Polgar Institute for Chess Excellence (SPICE) said the billboard was made to start a global conversation and attract students who are interested in chess. Zehner said she does not want to disrespect the Webster chess program, but the billboard “cheapens” the athletic department. She said she understood the context of the joke Webster wanted to make in relation to the University of Missouri – Columbia billboards, which are less than 10 miles away from Webster’s billboard. Seven Webster athletes have tweeted at Webster using the hash tag “#WUBillboard.” One of those athletes was her brother Danny Zehner, junior on the men’s basketball team, who first showed her a photo of the billboard. Aubuchon said she remembered a sign in Marlettos about the chess team after its 2012 national championship. “I understand why they don’t want to spend so much money on the chess team and not us,” Aubuchon said. Senior Center fielder Corey Lasky said he sees the message as something he can’t control. Zehner said she does not want to disrespect the Webster chess program, but the billboard “cheapens” the athletic department. She said she understood the context of the joke Webster wanted to make in relation to the University of Missouri- Columbia billboards, which are less than 10 miles away from Webster’s billboard. Seven Webster athletes have Tweeted at Webster using the hash tag “#WUBillboard”. One of those athletes was her brother Danny Zehner, junior on the men’s basketball team, who first showed her a photo of the billboard.